Hey everyone! I’m happy to announce that starting today my wife, Noah’s Mom, MD, will be writing some of the daily blog posts. 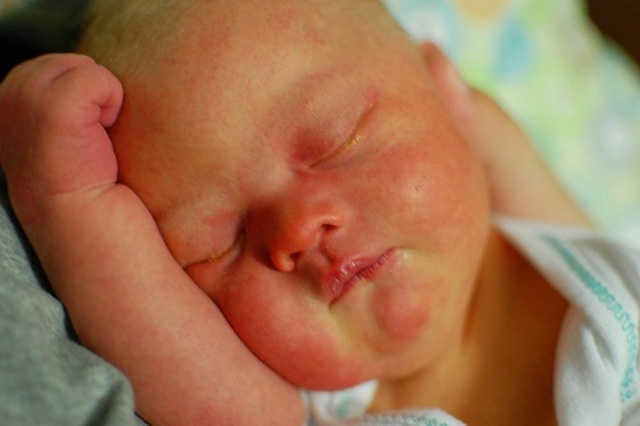 As many of you know, we post a daily video blog post of our son who was born with Down syndrome. In addition to creating, editing, uploading and posting the daily videos, I also write about our story each day as well as post all of the pictures. As you can imagine this takes a ton of time, so I’m thankful my wife is willing to be a part of all this fun! By the way, you’ll know if the post was written by Noah’s Dad, or Noah’s Mom, MD by looking at the author box at then end of each post! Enjoy! Noah in the Moby for his first movie. Noah’s first movie was Gnomeo and Juliet. I convinced my best friend that she needed to take her two younger sisters to the movie as well. My theory was that there would be other kids there and if it ended in disaster everyone would understand. 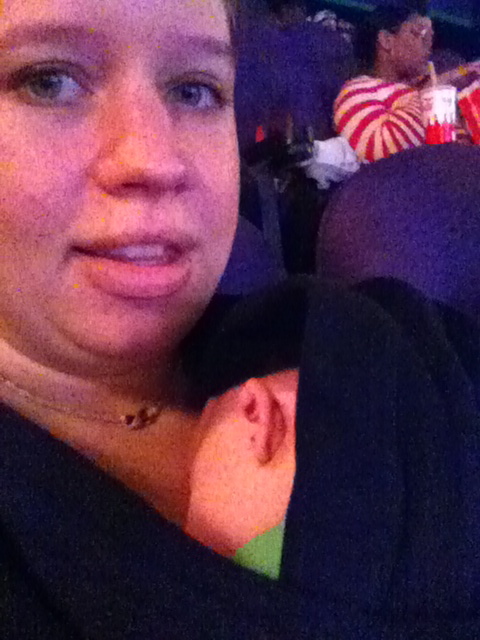 I wrapped him in the Moby and he almost slept through the entire movie. He started fussing during the last 15 minutes but I was able to calm him down as I walked in the hallway. So…I was able to watch the entire movie….just not from my seat! Despite how well he did, I was nervous the entire time and didn’t enjoy the movie as much as I usually do. So basically I decided that all of that worry wasn’t worth the ten dollars it cost! Besides…we’d have more fun just hanging out at home. I have no idea how those two movies ended. Not only did I miss the endings, but the parts I did get to watch I couldn’t really enjoy. I was on the edge of my seat the entire time due to Noah. Any movement or squeak he made took my attention away from the movie and on to Noah as I searched for a pacifier, considered feeding him, or taking him out and rocking him to try and keep him from having an outburst. He has never had an outburst, but I’m convinced the movie will be the first place this will occur. I have figured out two other methods to try (notice I am still refusing to listen). One is to take the baby in the evening when they are typically down for the night. Noah is nearly impossible to wake once he is asleep. I”ll never judge the late night moviegoers again. The baby will likely sleep through the entire movie. We have not tried this method yet, so my opinion may change. This baby knows how to sleep! The other method I tried today. We were the only ones in the theater so we could be as loud as we wanted. Who cared that he wanted to talk to Johnny Depp. I also swear that he was actually interested in what was occurring on the big screen for about five minutes. It was similar to being at home and I enjoyed every minute of the movie. That was until the credits started rolling and an older gentleman exited the theater…where in the world was he hiding the whole time!? After the movie, Noah and I went home. He continues to love playing on the texture blanket my best friend made. He may not be close to crawling but he can get anywhere he wants by rolling. One day I left him for about 30 seconds and when I came back in the room he had rolled under the sofa…! This day gave me a glimpse of the days to come as my schedule will be more of Noah and less of work. I cannot wait for all of our future dates. Have you tried taking your baby to a movie? What methods have (or haven’t) worked for you? So great to read a post by you! Your posts about Down syndrome are so great and informational! We have never tried taking j to the movies, but if we did I think we would choose the late movie so he would sleep. He is the same as Noah. When he’s out for the night, he is out. You’re not waking him up! When he was littler he wouldn’t even wake up to eat! He’s slept through the night since 8 weeks. We’ve got a good little sleeper. Which will spoil is of we have more kids. Haha. I have much to say about Noah sleeping through feedings…his first few weeks were brutle. His newborn screen came back for a condition that if he truly had it he could not fast for more than 4 hours. We used wet washclothes, changing the diaper, and even ice. Once we were free of that he slept for 8 hours 🙂 It was great. Here is another method of watching a movie, my personal favorite, Noah stays home with Nana while you go to the movie! So it took Abbie writing a post to get you to comment! I love it! If you are still breastfeeding – just keep your seat! It is dark and noone will notice…unless he is a noisy eater then at least they won’t be able to see a red faced, embarassed mommy! Genius idea on the afternoon movie and GREAT for you for NOT listening – Life doesn’t stop, it becomes more enriched!